This word is almost unknown in the USA but may be found in literary writing in Britain. It was spotlit by news in March 2006 that a poll of undergraduates in Oxford had overwhelmingly rejected proposals by the University authorities that they should no longer wear subfusc during examinations. The word emerged in the early years of the eighteenth century. It means something dull, dark or gloomy and is related to the older fusk, long obsolete, for a dark brown or dusky colour. That’s from Latin fuscus, dusky, which has also given us the rare adjective fuscous for a dark and sombre colour as well as the more common obfuscate, to render obscure, unclear, or unintelligible. Subfusc was taken directly from the Latin subfuscus; in this case the sub- prefix means “of the approximate colour” (two other examples are subalbidus, whitish, and subviridis, greenish). Around the middle of the nineteenth century, the word began to be applied to the formal costume of Oxford undergraduates and later to that of students at other universities. Since the first example in the Oxford English Dictionary’s entry is from the comic novel of Oxford life, Verdant Green by Cuthbert Bede, we may guess that its first application was intended to be humorous. 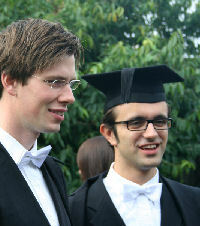 But it has long since become standard, and appears in the current Oxford University regulations set down in 2002 by the Vice-Chancellor: “All members of the University are required to wear academic dress with subfusc clothing ... when attending any university examination.” For men this is a dark suit and socks, black shoes, a white bow tie, and plain white shirt and collar; for women, a dark skirt or trousers, a white blouse, black tie, black stockings and shoes. To these have to be added a student gown and a mortarboard cap, though the latter may be carried rather than worn. In my day at Cambridge, if I may reminisce, clothing regulations were rather less strict, but you had to wear your academic gown or be refused entrance to the examination room (and indeed refused service at dinner in hall). Last modified: 17 November 2007.